Certain dorm essentials create a finishing touch on the look you are trying to create. The detail may be small, but once you add that detail it makes a huge difference. This goes for both your dorm room decor and gifts for family and friends. When you've given and received a gift, you know there's a huge difference between a gift wrapped box and a box that has wrap, ribbon, and more. The box that has ribbon and other cute accents to the packaging looks like there was more thought and care placed into the gift. Recreate that look with though, care, and our Black Glitter Ribbon. 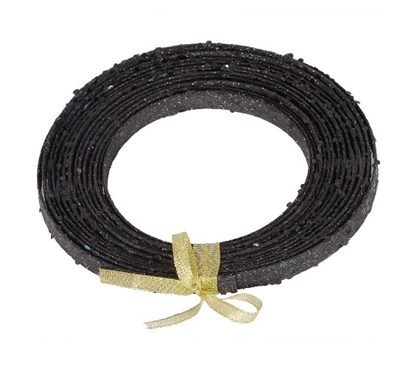 Our Black Glitter Ribbon will make the perfect accent to a gift for mom and dad. This dorm essentials item is thick and sturdy with black glitter flecks and will make your gift wrapping look amazing. The thick and sturdy design of this dorm necessities item also makes it ideal for your dorm room decorations. You can add this dorm item as an accent to your college dorm room door, dorm desk, and college Christmas tree. Plus since this college supplies item is black, you can even do some dorm room decorating during Halloween with this dorm item in your dorm room decorations!